Picture a place rich in natural beauty with sunny, clear days and brilliant stars lighting the night sky over desert cities. High sand dunes glow golden; beneath them, dinosaur bones have rested for millions of years. Think of herds of giraffes and elephants, and lions prowling in the savanaa. Imagine millennia-old engravings in sandstone mountains, and ancient mud-brick villages with artistic, Sudano-Sahelian architecture. This is Niger, and this is a place that, someday, many will be able to experience. At this time, due to threats from extremist and terrorist organizations, foreigners are urged not to travel to Niger unless accompanied by armed guard. 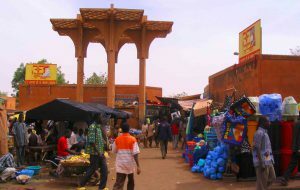 But Niger has the potential for tourism once it becomes more stable, and that is possible. Several countries have risen from poverty to economic stability and become popular holiday destinations. Namibia, for example, dealt with guerilla wars in the late 1900s, and now over a million people a year visit to discover its wildlife. Just 40 years ago, Cambodia was fraught with civil war and genocide; now foreigners visit its temples and immerse themselves in its culture. Once a country becomes more stable, tourism starts small, usually through volunteering programs. Tours are created to target poverty in villages. Towns develop as local entrepreneurs gain the opportunity to grow their businesses. More jobs become available thanks to the influx of tourists. Eventually, enough cash flow invigorates national parks and museums. The same can happen in Niger. 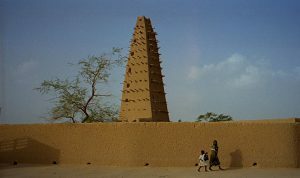 Niger offers beautiful scenery and experiences. Hippos bathe in the Niger River, which passes through mangrove trees and other lush vegetation. Park W, a UNESCO World Heritage site, protects rare species of elephants, hyenas, lions, oryx, and more. West Africa’s last remaining herd of giraffes lives in the Kouré Giraffe Reserve, and is quite friendly with the locals. Tourism can also have positive environmental impacts by helping to fund security. Niger’s ancient culture is preserved through engravings and paintings in the northern Aïr Mountains among ancient volcanic craters. In Iwellene, animal engravings over 8,000 years old are spread over 10 acres, including two life-sized giraffes, one of the greatest works of prehistoric art. In Niger’s capital, Niamey, tourists could haggle for handwoven blankets, intricately imprinted leather boxes, and colored straw mats, and snack on ginger-spiced sourdough pancakes and moringa leaf cous-cous. The adventurous could climb the minaret of the Grande Mosque and admire the colorfully patterned buildings. Visitors from around the world could experience cultural festivals throughout Niger and meet friendly people with a lively, resilient spirit. One day, I hope that Niger will be known around the world for these experiences. We cannot expect change to come at gallop, although Wells Bring Hope helps provide a little more stability, one village a time. Niger is a country with great potential, naturally and culturally, and I’m hopeful that someday the rest of the world will experience it too.